Itkowitz PLLC Teaching and Publishing: Tenant Buyouts for the Next Generation -- the Press Got it Wrong! Tenant Buyouts for the Next Generation -- the Press Got it Wrong! On June 1, 2016 I appeared at the Terra-CRG Only Brooklyn Real Estate Summit to speak on Tenant Buyouts. This was my most left-wing leaning presentation to landlords ever, and yet the Press decided to slam me as being anti-tenant. That's just so wrong. And so not helpful to either landlords or tenants. I represent as many tenants as landlords and have saved many homes. I am saving homes as we speak today. As with all my pieces -- this piece is as useful for tenants as it is for landlords. The piece sought to educate landlords about why tenants don't want buyouts (because they cant afford other places in this economy), that tenants should NEVER be harassed (and I took the audience through the new harassment laws), and I told them absolutely NO frivolous, baseless holdovers! The piece tells landlords to look tenants in the eye, shake their hands, and own their agendas - not lie to them and sneak around. It supports using the ONLY vehicle to abolish a Rent Stabilized tenancy that is sanctioned by the legislature - Demolition Eviction, which compensates tenants and gives them time to move or requires landlord to move them. 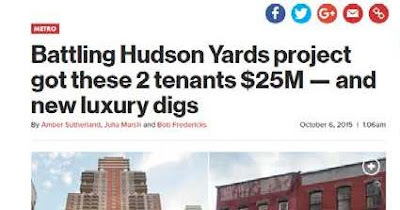 I am so disappointed -- because I was trying to reeducate EVERYONE (AGAIN THIS IS INFO TENANTS NEED AS WELL), and the press then just undoes all my hard work by making this just another evil gentrification story. And then out come the haters and then lies, if repeated often enough, become a new truth. READ THE PIECE -- COPIED IN FULL BELOW AND DECIDE FOR YOURSELF! This is bigger than my little women-owned law firm, people. Until landlords and tenants can come together and work together, things in this town are just going to get harder and harder. I URGE you to read the piece below. I. WHY THIS BOOKLET ON TENANT BUYOUTS IS EXTREMELY DIFFERENT FROM THE BOOKLET I WROTE ON TENANT BUYOUTS THREE YEARS AGO. Three years ago, when I wrote a booklet on Tenant Buyouts, it was a very different piece then this one. So different, in fact, that I deleted the earlier book from my website. What changed? Well, for one thing, I changed. I evolved as a lawyer, a lawyer who represents both landlords and tenants in buyout negotiations. I gained new insights that I think are very much worth sharing. · Paying a new, higher rent. Finally, the pace of development in New York City has become furious, and that has been transformational for so many aspects of real estate law, including Tenant Buyouts. The problem is that the real estate community and most of their lawyers simply have not kept up with the changing climate regarding Tenant Buyouts. They are still doing things today the same way they did five years ago, and expecting the same or better results (the results were often not that good five years ago). There seems to be no learning, no adjustment, no growth. I have the SAME conversations with owners and managers repeatedly. Owners want to do things the same old way – dance around the tenant, pressure the tenant, rant about the tenant. But none of that works to recover the premises. It is as if they keep going to a dry well again and again and expecting that one day it will have water. This booklet (I hope) offers a better way for a landlord to approach and achieve a Tenant Buyout. II. STEP 1: UNDERSTAND THE PLAYING FIELD: THE CURRENT CLIMATE – TENANTS GOT THE MEMO – IF THEY MOVE, THEN OWNERS MAKE WAY MORE MONEY. You must understand the current playing field for tenant buyouts. Tenants have gotten the memo: If they move, the owners make way more money. Securing a buyout is a balancing act – how much is enough money to get the tenant to go, but not so much that paying it obviates the reason for getting the tenant out in the first place? Consider two different tenancies. Apartment Status: Free Market, 22 months left on the lease. Tenant’s Profession: Tech. Made a company. Doing well the last two years. Future uncertain. Ties to Neighborhood: Likes the neighborhood and the cool bars and restaurants, but does not see himself raising a family there. May move back to where family is in Philadelphia, depends on his job. Sees himself owning a home one day. Ties to Neighborhood: Goes to church in neighborhood, many friends there, grew up in the area, has rented all her life. Now let us assume that it does not make sense to offer the tenant a dime more than $40,000.00 to get out of the way. Obviously, Tenant #1 is more likely to take the buyout than Tenant #2. Tenant #1 is not protected by Rent Stabilization like Tenant #2, pays more rent than Tenant #2, and is less attached to the neighborhood than Tenant #2. Tenant #1 is younger and more nimble than Tenant #2. Additionally, Tenant #1 has a much better chance than Tenant #2 of being able to take the $40k and get a mortgage for a nice co-op or condo because he has a better credit score and has made more money over the last 24 months. Fundamentally, Tenant #1 sees himself as a temporary renter and a homeowner someday. Tenant #2 already has the perfect living situation – a two-bedroom, affordable, Rent-Stabilized apartment that she can pass on to her daughter. Tenant #2 is probably not taking a $40,000.00 buyout. Tenants are like snowflakes, no two are identical. Tenants are people, with lives, obviously. You may believe, based on what little you know about a certain tenant, that the tenant has little incentive to move. But you never know who just got a job offer in San Francisco, or who’s girlfriend wants to move to Thailand, or whose knees can’t take the stairs on the 5th floor walk-up anymore, or who just won the lottery for a new construction Rent Stabilized apartment in Brooklyn (I represented a tenant like this recently). There are many reasons to move. And a landlord’s buyout offer might come at the perfect time. You cannot know until you ask. The key is to ask NICELY – we will get to that below. IV. STEP 3: LOOK BEFORE YOU LEAP – STRATEGIC PLANNING – THIS STARTS BEFORE THE MULTI-FAMILY ACQUISITION – RENT STABILIZATION DUE DILIGENCE. The process of de-tenanting a development site or a major reconstruction project should begin BEFORE the building is purchased! The old saying goes that the three most important things about real estate are: location, location, and location. Keeping that rule in mind, one should add our rule about the three other most important things about multi-family real estate, and those things are: the tenancies, the tenancies, and the tenancies. Hello! A building's value is a function of the tenancies. My clients often retain us after they buy buildings without knowing very much about the tenancies. They then bring their landlord and tenant legal problems to us. So often we say to a client, "Client, why didn't you ask us about this situation BEFORE you went to contract, or, at least, while you were in contract? We could have mitigated the damage (or at least predicted it) had we known about this sooner." Thus, we suggest that owners, managers and developers consult us during the property acquisition phase for Rent Stabilization Due Diligence. Indeed, we can look at a building and see it in a way that an engineer, architect or transactional lawyer cannot. We see what is at the heart of the building - the tenancies. (1) We look for anything about the building or the tenancies that would stymie legal action, should it be necessary. (2) We look for overcharges. (3) We look for vulnerabilities in Rent Stabilized tenancies. (5) We enter into an interactive process with the owner, whereby a strategic plan for achieving the building’s goals is formulated – be that to maximize the rent roll or de-tenant or something in between. We refer to the process as “Due Diligence”, but we can perform the analysis before a contract is entered into, during a due diligence period, or after a property is purchased. We have performed this service for purchasers, sellers, and lenders. Two guys in Brooklyn bought an eight family building with only three Rent Stabilized apartments occupied. One of the occupied Rent Stabilized apartments was clearly not being used by the tenant as her primary residence. In fact, the tenant lived elsewhere and she was using the apartment solely as an office for her party-planning business. The new owners were excited to start a case against this tenant. But they could not! The tenant’s Rent Stabilized lease had long ago expired. You can ONLY do a non-primary residence case by first sending what is known as a “Golub Notice”, a special notice of non-renewal that can only be tendered between 150 and 90 days of the lease expiration. If there is NO LEASE, the lease can’t end. NO ENDING DATE means no Golub Period. NO GOLUB PERIOD means NO NON-PRIMARY RESIDENCE CASE. The only thing these new owners could do was to send this tenant, who was so clearly not living there, a new Rent Stabilized lease and wait two years to do a non-primary residence case! IF THEY HAD COME TO US BEFORE (or even during) the contract, we could have advised that the lease should be immediately renewed, and therefore, shaved months off the project. V. STEP 4: STUFF NOT TO DO – NO HARASSMENT, NO FRIVOLOUS LITIGATION, AND NO SUPERS! The New York City Housing Maintenance Code was amended last summer (2015) (the new stuff is in § f) to seek to prevent owners from harassing tenants regarding buyouts. The new law went into effect in December 2015. I think all owners and managers should read it, so below my summary of what the law says I include the whole statute. Tenant can notify landlord in writing that he or she does not wish to be contacted by landlord for 180 days. Landlord must honor this. (5) that such person may, in writing, refuse any such contact and such refusal would bar such contact for 180 days, except that the owner may contact such person regarding such an offer if given express permission by a court of competent jurisdiction or if notified in writing by such person of an interest in receiving such an offer. …other repeated acts or omissions of such significance as to substantially interfere with or disturb the comfort, repose, peace or quiet of any person lawfully entitled to occupancy of such dwelling unit and that cause or are intended to cause any person lawfully entitled to occupancy of a dwelling unit to vacate such dwelling unit or to surrender or waive any rights in relation to such occupancy. g. other repeated acts or omissions of such significance as to substantially interfere with or disturb the comfort, repose, peace or quiet of any person lawfully entitled to occupancy of such dwelling unit and that cause or are intended to cause any person lawfully entitled to occupancy of a dwelling unit to vacate such dwelling unit or to surrender or waive any rights in relation to such occupancy. · Owner’s use of the apartment (but for this to work, Owner or his immediate family need to be able to prove that they will actually live there, and this is only a temporary exemption from Rent Stabilization anyway). Most of the time, most tenants will be in compliance with their lease and statutory obligations and there will be no grounds for eviction. I will NEVER understand why landlords and their lawyers think it is a clever idea to bring a baseless case against a tenant when attempting to secure a buyout. There are some traps in nature, like a spider web, where when the creature caught in the trap struggles, it becomes more tightly caught. When a Rent Stabilized tenant is blocking a project, owner is caught in a trap. Unfortunately, many owners feel that they MUST do something. But, in fact, the captors (the tenants and their contingency fee lawyers) are COUNTING on the stymied owner struggling. A tenant looking for a buyout usually wants to cost owner time, energy, and money. There is absolutely no point to the “frivolous holdover”. A well-represented tenant in on a groundless holdover isn't going to cower in fear. She is going to counter sue you for an overcharge and legal fees. She may do a separate discrimination or harassment case, and she's going to start calling HPD and doing HP proceedings against you. You want her out of an empty building and suddenly you are paying to fix the paint in the hallways of a building you want to knock down because HPD has ordered you to. Now you are struggling like a trapped fly and NONE of it shakes the tenants loose, it just expends your energy. This will: (a) show weakness, and (b) expend time and money on nothing. Owner will not be wearing the tenant down; owner will be wearing himself and his partners down. Strength is not always about aggression or immediate action. Sometimes strength is about planning and patience. Wait until the spider is asleep, and then deftly free one arm and use that to free the other. Demolition eviction, discussed at length below, is a good tool for cutting the spider web of a Holdout Tenant. OMG please do not send the existing super to speak to the tenants about a buyout first. Why does anyone think this is a good idea? You have no idea: (a) what the super is really saying, and (b) whose side the super is really on. Supers have a way of playing the landlords and the tenants against each other. This is a major project for you and you are sending the super (who until 5 minutes ago did not even work for you) in to negotiate on your behalf? Why? Another thing that I will never understand is why new owners think they should tiptoe around the tenants upon meeting them after the acquisition of a building, which owner wishes to de-tenant. I see this again and again. “When we introduce ourselves to the new tenants don’t say anything about the project!” Why? It isn’t exactly a secret. Most tenants have been living in an increasingly empty building as seller failed to re-rent whenever a tenant left. Again, see above, tenants have gotten the memo – they know you want them out. The essence of life is change, especially in this vibrant city. This building was built in 1910. It is 2016. This building is obsolete. Our plans are to demolish the building and build even more housing units. We understand and honor that this is and has been your home. As we move forward in our process, we want to make your transition as painless as we are possibly able to. We are open to discussing a buyout, at your convenience. Own your agenda and be honest with the tenants – that is the ultimate sign of your respect for them as human beings and your personal strength and confidence in your project. VII. STEP 6: LOW-HANGING-FRUIT TENANTS -- LOW BUYOUT AMOUNTS AND NO LAWYERS – THE VULNERABILITY OF THESE SETTLEMENTS AND THE PROPER USE OF THESE TACTICS. This is an old conundrum for anyone vacating a building. If the tenant has a lawyer the deal is solid. But if the tenant has a lawyer the tenant will want more money. I cannot solve that for you. I can only tell you your options. I often prepare a short agreement for unrepresented tenants. Such agreement will protect owner LESS than my normal thick buyout package. But that doesn’t matter because NO agreement can protect owner fully from an unrepresented tenant. And the lighter agreement will be less likely to scare the tenant off. We call this the “low hanging fruit agreement”. There are other was to induce a tenant to move that have nothing to do with harassment, litigation, or buyouts. I have seen owners take a $40,000.00 buyout sum, and buy a condo in the area -- a condo that is nicer than the tenant’s current Rent Stabilized Apartment. In that case, owner would give the tenant a Lease-for-Life for the condo unit. When the tenant dies, owner has an appreciated asset. Another solution is to move the tenant to another Rent Stabilized apartment that the landlord owns or can otherwise locate. We represented a landlord in a case where a tenant stood in the way of a development project in Manhattan. Tenant wanted money to get out, for sure. But the parties couldn’t close in on a number. The tenant was in his late thirties. We sent an associate attorney to one routine appearance, and the associate was in his mid-thirties. The tenant and our associate, two guys in the same age range, had a long afternoon wait on a bench in the court’s hallway. They hit it off and chatted. (The tenant, himself a lawyer, was pro se so our associate could speak to him without counsel). Via that conversation, we discovered that one of the tenant’s biggest issues was getting his three little kids into a good school district so he would not have to pay for private school. The landlord ended up paying for a broker to relocate the tenant on a certain block in Park Slope. You need to figure out what moves people. You can only do that if you keep civil communications going between owner and tenant. IX. STEP 8: IDENTIFYING THE HOLDOUT(S) AND DEALING WITH HIM (OR HER) FIRST. You will not hear anybody else say what I will be saying in this section. But here’s the truth about “the Holdout” (in my humble opinion). First (and this part is not controversial), the Holdout can be defined as the tenant who will not get out of the way of owner’s project. He (or she) remains in the way until a late date, when the project imminently needs to begin and the owner is losing money. The Holdout uses this position, this leverage, to demand a larger buyout than owner wants or, in many cases, is able to pay. Here is my big insight about the Holdout – the Holdout is not asking for a million dollars because he is the last man standing. No. The Holdout is the last man standing because he wants a million dollars! In other words, the Holdout does not end up in your way by accident. She was planning to be there on Day One. You also need to consider that it is not so easy to be a Holdout; it is not a path for everyone. My extensive experience over twenty years in this profession is that MOST tenants to not like litigation and do NOT want to take on their landlords. I have so often seen tenants with significant rights walk away from enforcing those rights because to do so means litigation, which is – expensive, time-consuming, and stressful, and might mar their chances of renting an apartment in the future. Most people have real lives – jobs and families and interests. Being a Holdout takes energy. It takes a particular personal strength. Think of every horror movie you have ever seen – what is creepier than an EMPTY building? Think of your own kitchen at 2:00 a.m. when you go downstairs because you can’t sleep and it’s empty and quiet – creepy right?!?! Well imagine being the last man or woman living in an otherwise empty building, a building where you know you are implicitly unwanted. That’s not everyone’s cup of tea. A Holdout is a special person. Furthermore, I am asserting that the Holdout is usually identifiable at the beginning of a de-tenanting process. I informally surveyed ten owners and managers that I respect, and half agreed that they knew on Day One who the problem tenant would be. There is no science here (unless I conduct a bigger survey), but the Holdout usually telegraphs his “Holdout-ness” as soon as you meet him. If he has a lawyer, that’s a give-away. If he doesn’t have a lawyer yet and you are speaking directly to him, he tells you how well he knows his rights, how hard it will be to move, and asks for more money than owner budgeted for him. He has a victim mentality. He files complaints with HPD and DHCR. The key is to identify the Holdout and deal with him or her EARLY. I will never understand why owner’s say, “He’s going to be a problem, let’s leave him for last?” Really?! What good will that do? I had a group of young developers in my office 6 months ago. They had just acquired a multi-family building in Brooklyn. About 25% of the apartments were occupied. Upon meeting their new tenants one announced that he wanted $50k. I asked the young developers, “Is that what you had budgeted?” The answer was, “Yes.” I said, “Well give it to him.” No, they didn’t want to give it to him, they wanted to wait. This made no sense to me. About a week ago they were back in my office. Now this dude is the last guy left and he wants $1M and he just gave owner’s one of those 180 Day Letters – in other words, “I want $1M and we can re-discuss it in 6 months, enjoy the carrying costs of your building with no rent roll.” They would gladly give this guy $50k today! But they can’t even approach him for 6 months and now he wants $1M! Deal with the Holdout, as with all your thorny problems in your life and business, EARLY. Will paying the presumptive Holdout a big number jack up the other buyouts in the building? Maybe, maybe not. You can attempt to keep the deal confidential, and remember everything we explored above about not everyone wanting to camp out in an empty building while fighting a war with their landlord. I know only this much – letting the Holdout be the last man standing is never a wise move. Now, let’s talk about Demolition Eviction. In order to achieve an eviction on the grounds of demolition, you must comply with the following requirements. Demolition eviction requires the owner to first get the permission of the New York State Division of Housing and Community Renewal (“DHCR”). 9 NYCRR 2524.5(a). The owner must submit proof to the DHCR of the owners financial ability to complete the project. 9 NYCRR 2524.5(a)(2)(i). Evidence of financial ability to complete the project may include a Letter of Intent or a Commitment Letter from a financial institution, or such other evidence as DHCR may deem appropriate under the circumstances. DHCR Operational Bulletin 2009-1; See also Peckham v. Calogero, 12 NY3d 424 (2009), below. In Porter v. DHCR, NYLJ, 5/5/08, p. 27, col. 4 (App. Div. 1 Dept. ), a DHCR decision to grant landlord's demolition application was upset by the fact that landlord’s attempts to demonstrate its financial ability to complete the proposed demolition project were inconsistent with the fact that DHCR found that landlord had greatly underestimated the required tenant relocation expenses. In 1804 Washington Avenue Corporation, DHCR Adm. Rev. Docket No. WJ420025RO (7/9/09) LVT Number: #22195, Landlord asked the DHCR for permission to evict a Rent Stabilized tenant in order to demolish a Single Room Occupancy (SRO) hotel building in an Historic District, with one remaining tenant. The District Rent Administrator (“DRA”) ruled against landlord, finding that landlord failed both to submit certain DOB approval documentation and to prove it was financially able to complete the proposed demolition and construction project. Landlord appealed and lost. Landlord claimed that the demolition would cost $100,000.00 and the construction would cost $500,000.00. The bank loan statements landlord submitted to the DRA were issued more than two years before landlord filed its application. Landlord didn't show that the loan money may be used, or was even still available, for the construction project. Landlord also failed to prove that it had approved plans from DOB for the proposed work. In Calamaras, DHCR Adm. Rev. Docket Nos. VC420007RT, VC420008RT (12/6/07) LVT Number: #20223, the landlord sought permission not to renew tenant's Rent Stabilized lease based on landlord's intention to demolish the building. The DHCR ruled for the tenants when landlord hadn't proved its good-faith intent to proceed on the project. Landlord's building plans hadn't been approved by DOB, that there appeared to be no final commitment to any particular building size or configuration, and that landlord hadn't previously completed any construction projects and didn't meet the requirements regarding financial ability to complete the proposed project. In Ando, DHCR Adm. Rev. Docket No. UH420017RT 8/23/06 LVT Number: 19118, the landlord sought permission not to renew tenant's Rent Stabilized lease based on landlord's intention to demolish the building. The DRA ruled for landlord. Tenant appealed and lost. Tenant claimed that landlord hadn't proved its financial ability to complete the demolition. In a separate proceeding, the DHCR had determined that landlord had submitted sufficient proof of its financial status. Landlord could proceed with eviction action against tenant. See also Peckham v. Calogero, 12 NY3d 424 (2009), below. The plans for the project must have been already approved by the appropriate city agency (Department of Buildings, Landmarks, Department of Environmental Protection, whatever is required). 9 NYCRR 2524.5(a)(2)(i). The definition of “demolition” has been challenged, and the law is governed by the Peckham v. Calogero, 12 NY3d 424 (2009), so we examine the case in detail below. Pekham also contains an important holding regarding the definition of “financial ability” to complete the project. Peckham started in 2004 and took until 2009 to resolve because it went all the way up the New York State’s highest court, the Court of Appeals. Landlord won. The building was a 40 foot deep, three-story, eight (8) unit Rent Stabilized Building in Manhattan. The owner wanted to build a 70 foot deep building with twelve (12) units in its place. Regarding the “financial ability” that must be shown before a demolition application is granted, DHCR has stated that “[e]vidence of financial ability to complete the project may include a Letter of Intent or a Commitment Letter from a financial institution, or such other evidence as DHCR may deem appropriate under the circumstances” (DHCR Operational Bulletin 2002-1). In Peckham, Owner submitted (1) a printout from JPMorgan Chase Bank verifying that a bank account had been opened and funded in the amount of $4,800,000.00 and (2) a letter indicating that these funds were to be applied toward Owner's demolition/construction project. Although the letter was addressed to a different Limited Liability company (“LLC”) than the ownership LLC, there was ample basis for DHCR to infer that the borrower LLC and ownership LLC were affiliates. Another illustrative DHCR case concerning the efficacy of the architectural plans with respect to a Demolition Eviction application is 1205-1215 First Avenue Associates, LLC, DHCR Adm. Rev. Docket Nos. YI4100086RO et al. (1/27/14) LVT Number: #25497. In 1205 First Avenue, Landlord asked the DHCR for permission to refuse renewal of Rent Stabilized tenants' leases based on its intent to demolish the building. The DRA ruled against landlord, finding that it didn't have the required architectural plans or proof of financial ability to complete the project, and that landlord didn't proceed in a timely manner. Landlord appealed and lost. The DHCR's Operational Bulletin 2009-1 states that, on 30 days' written notice, the DRA can dismiss a demolition application based on landlord's failure to proceed in a timely fashion. During the DHCR hearing process, landlord's architect died. Landlord's new architect then refused to adopt the prior architect's plans. Landlord claimed that it was unfair to find that landlord wasn't proceeding in a timely fashion on that basis. But landlord's plans would have required revision in any event. The new architect stated that 2008 Building Code changes now required the inclusion of ductwork in the plans. Also, exit stair width requirements had been increased. Consequently, this required a redesign of exit stairs and a revision to the plans. ADA requirements, mandated by the federal Fair Housing Act, also had replaced the requirements of Local Law 58, now requiring that various areas of the apartments be larger than previously provided for. The DRA's hearing officer was therefore correct to dismiss the application for failure to prosecute. Landlord could refile a new application based on current conditions. The owner must pay the tenant’s reasonable moving expenses. 9 NYCRR 2524.5(a)(2)(ii)(a). The owner must pay the tenant a “stipend” of $5,000.00, provided the tenant leaves by the vacate date in the DHCR’s order. 9 NYCRR 2524.5(a)(2)(ii)(a) and (b)(1). The owner must relocate the tenant or pay the tenant a large additional stipend based on a formula established by the DHCR. 9 NYCRR 2524.5(a)(2)(ii)(b)(1). The owner can, in essence, buy the tenant out, but such “buyout” is really a 72 month stipend based on an established formula set up by DHCR that is calculated based on the number rooms in the apartment (no less than three) and the tenants current rent. 9 NYCRR 2524.5(a)(2)(ii)(b)(3). The “Demolition Stipend Chart” is included with Operational Bulletin 2009-1. An owner would have to pay a tenant in a six-room apartment, whose rent is $1,000.00 per month, $1,958.00 per month for 72 months, or $140,976.00. An owner would have to pay a tenant in a three-room apartment, whose rent is $1,500.00 per month, $78.00 per month for 72 months, or $5,616.00. This option is NOT available, however, if the stipend would result in the tenant losing a subsidy or other governmental benefit which is income dependent. In that case, the tenant may elect to waive the stipend and have the owner at his or her own expense, relocate the tenant to a suitable housing accommodation at the same or lower legal regulated rent in a closely proximate area. 9 NYCRR 2524.5(a)(2)(ii)(c). Therefore, it is important to note that this option (perhaps the most desirable) is not always available. The owner has the option to (or if the above-discussed stipend would result in the tenant losing a subsidy or other governmental benefit which is income dependent then owner must) move the tenant out of the way permanently. In that case, the alternative housing must satisfy at least three criteria 9 NYCRR 2524.5(a)(2)(ii)(b)(1). The alternate housing accommodation must be “suitable”. 9 NYCRR 2524.5(a)(2)(iii). Let us now examine what “suitable” means under the law. In the event a comparable housing accommodation is offered by the owner, a tenant may file an objection with the DHCR challenging the suitability of a housing accommodation offered by the owner for relocation within 10 days after the owner identifies the housing accommodation and makes it available for the tenant to inspect and consider the suitability thereof. Within 30 days thereafter, the DHCR shall inspect the housing accommodation, on notice to both parties, in order to determine whether the offered housing accommodation is suitable. Such determination will be made by the DHCR as promptly as practicable thereafter. In the event that the DHCR determines that the housing accommodation is not suitable, the tenant shall be offered another housing accommodation, and shall have 10 days after it is made available by the owner for the tenant’s inspection to consider its suitability. 9 NYCRR 2524.5(a)(2)(iii). In the event that the DHCR determines that the housing accommodation is suitable, the tenant shall have 15 days thereafter within which to accept the housing accommodation. A tenant who refuses to accept relocation to any housing accommodation determined by the DHCR to be suitable shall lose the right to relocation by the owner, and to receive payment of moving expenses or any stipend. 9 NYCRR 2524.5(a)(2)(iii). Suitable housing accommodations shall mean housing accommodations which are similar in size and features to the respective housing accommodations now occupied by the tenants. 9 NYCRR 2524.5(a)(2)(iii). Such housing accommodations shall be freshly painted before the tenant takes occupancy, and shall be provided with substantially the same required services and equipment the tenants received in their prior housing accommodations. 9 NYCRR 2524.5(a)(2)(iii). The building containing such housing accommodations shall be free from violations of law recorded by the city agency having jurisdiction, which constitute fire hazards or conditions dangerous or detrimental to life or health, or which affect the maintenance of required services. 9 NYCRR 2524.5(a)(2)(iii). The DHCR will consider housing accommodations proposed for relocation that are not presently subject to rent regulation, provided the owner submits a contractual agreement that places the tenant in a substantially similar housing accommodation at no additional rent for a period of six years, unless the tenant requests a shorter lease period in writing. 9 NYCRR 2524.5(a)(2)(iii). The alternate housing accommodation must be “at the same or lower legal regulated rent”. 9 NYCRR 2524.5(a)(2)(iii). The alternate housing accommodation must be “in a closely proximate area”. 9 NYCRR 2524.5(a)(2)(iii). If the owner intends to put the tenant back in the newly constructed building on the site, then the owner has to house the tenant in suitable interim housing provided at no cost to the tenant. 9 NYCRR 2524.5(a)(2)(ii)(b)(1). A fee owner, lessor, sublessor, assignee, net lessee, or a proprietary lessee of a housing accommodation in a structure or premises owned by a cooperative corporation or association, or an owner of a condominium unit of the sponsor of such cooperative corporation or association or condominium development, or any other person or entity receiving or entitled to receive rent for the use or occupation of any housing accommodation,…Any separate entity that is owned, in whole or in part, by an entity that is considered an owner pursuant to this subdivision, and which provides only utility services shall itself not be considered an owner pursuant to this subdivision. Except as is otherwise provided in sections 2522.3 and 2526.1(f) of this Title, a court-appointed receiver shall be considered an owner pursuant to this subdivision. The definition of “demolition” has been challenged, and the law is governed by the Pekham case (Peckham v. Calogero, 12 NY3d 424 (2009), so we examine the case in detail below. Pekham also contains an important holding regarding the definition of “financial ability” to complete the project. Peckham v. Calogero, 12 NY3d 424 (2009). Peckham started in 2004 and took until 2009 to resolve because it went all the way up the New York State’s highest court. Landlord won. The building was a 40 foot deep, three story, 8 unit Rent Stabilized Building in Manhattan. The owner wanted to build a 70 foot deep building with 12 units in its place. Regarding the “financial ability” that must be shown before a demolition application is granted, DHCR has stated that “[e]vidence of financial ability to complete the project may include a Letter of Intent or a Commitment Letter from a financial institution, or such other evidence as DHCR may deem appropriate under the circumstances” (DHCR Operational Bulletin 2002-1). In Peckham, Owner submitted (1) a printout from JPMorgan Chase Bank verifying that a bank account had been opened and funded in the amount of $4,800,000 and (2) a letter indicating that these funds were to be applied toward Owner's demolition/construction project. Although the letter was addressed to a different Limited Liability company (“LLC”) than the ownership LLC, there was ample basis for DHCR to infer that the borrower LLC and ownership LLC were affiliates. The owner is required to file Form RA-54, "Owner's Application for Order Granting Approval to Refuse Renewal of Lease and/or to Proceed for Eviction" with the DHCR. DHCR Fact Sheet #11. Once an application has been filed, an owner may refuse to renew tenants' leases until a determination of the owner's application has been made. Tenants may remain in occupancy during such period, and the owner may not increase the rents. Should the application be denied or withdrawn, the owner must again offer prospective renewal leases to the tenants, as directed in the DHCR's order of denial or withdrawal. DHCR Operational Bulletin 2009-1. Many of my clients come to me with buildings where their predecessor-in interest has allowed the Rent Stabilized leases to lapse. This is, for so many reasons, a terrible thing for an owner to do. In Rent Stabilization the lease protects the owner much more than the tenant. The tenant has all her rights, lease or no lease. The landlord, however, loses all kind of rights, even to sue for nonpayment of rent, if a properly renewed Rent Stabilized lease is not in place. Demolition eviction is predicated on refusal to renew an existing lease. The allowable time for the notice of non-renewal is within 90 to 150 days of the expiration of an existing lease. Absent a lease being in effect, the 90 to 150 day period cannot be arrived at. Santorini Equities, Inc. v. Picarra, 72 A.D.3d 73 (1st Dept. 2010). Therefore, until you have a firm plan of action for your Rent Stabilized building, make sure you renew the leases in a timely fashion and keep the building properly registered with DHCR. In New York City, pursuant to RSC Section 2524.2(c)(3), after filing a demolition application, an owner must serve each tenant with a Termination Notice at least 90 and not more than 150 days (the “Golub Period”) prior to the expiration of the tenant's lease term. Provided each tenant whose "window period" occurs prior to the issuance of the order is served with a timely Termination Notice, the order granting the application may be issued. DHCR Operational Bulletin 2009-1. The Termination Notice may be served either personally or by regular or certified mail. A contemporaneous affidavit providing dispositive facts by the person making the service or mailing a receipt indicating proof of certified mailing shall constitute sufficient proof of service. When service is by registered or certified mail, the stamped post office receipt shall constitute sufficient proof of service. Once such proof of service has been submitted to the DHCR, the burden of proving non-receipt shall be on the tenant. 4. the tenant must be offered a prospective renewal lease if the application is withdrawn or denied. The DHCR cannot order the eviction of any tenant. In other words, landlord gets a vacate order from the DHCR and the tenant does not go, then landlord must take the tenant to Housing Court for a summary holdover proceeding. Warrants of eviction must be obtained from courts of competent jurisdiction. DHCR Operational Bulletin 2009-1. (3) necessary demolition and construction permits must have been obtained. The Sound Housing Act has been held to be constitutional. Kalikow 78/79 Co. v.
State, 174 A.D.2d 7 (AD1st 1992). The DHCR may conduct a hearing on the Demolition Eviction application. DHCR Fact Sheet #11. But a hearing is NOT required. Various Tenants of 220 Central Park South, DHCR Adm. Rev. Docket Nos. XG420040RT-XG420066RT (12/28/09) LVT Number: #22472 and 220 CPS "Save Our Homes" Association v. DHCR, NYLJ, 4/2/09, p. 40, col. 3 (App. Div. 1 Dept. ), is a very interesting case. 220 Central Park stands for the proposition that no hearing is required and that DHCR cannot order an Environmental Impact Statement as part of a Demolition Eviction application. 220 Central Park also provides guidance on what it means for the landlord to have sufficient building plans and funds to complete the project. In 220 Central Park, the DHCR granted landlord’s application for permission to refuse to renew Rent Stabilized leases in order to demolish the building. Tenants appealed, claiming that the DHCR didn’t perform an environmental impact study (EIS). The court ruled for tenants, but the appeals court reversed, finding no requirement that the DHCR to conduct an EIS under the Rent Stabilization Code. The case was then sent back to the DHCR to allow tenants to comment on whether landlord had the financial ability to complete the project. The DHCR ruled for landlord. Landlord’s plan to raze the existing building to the ground and build a new, 41-story building with 75 apartments over the existing underground parking garage qualified as a demolition. DOB approved landlord’s plans. Landlord demonstrated the financial ability to complete the project. The projected cost of the demolition project was $307,772,205, and landlord’s financial capacity was substantially greater. Landlord’s corporate balance sheet reflected over $4.2 billion in financial capacity, consisting of $2.068 billion available cash, $308 million restricted cash, and $1.873 billion of unused bank revolving credit. Landlord’s cost estimate, prepared by a major worldwide construction management firm, also was credible. Notably, Tenants also claimed that a hearing was required by law. But no hearing was required. Neither the Rent Stabilization Law nor Code require a hearing in a demolition proceeding. And landlord showed that it had the good-faith intent to carry out the project by submitting approved DOB plans and proof of its financial ability to complete the project. Berkowitz, Milbourn, Farwell, DHCR Adm. Rev. Docket Nos. UH410047RT - UH410049RT (10/16/08) LVT Number: #20980, is an example of a DHCR case where a hearing was granted on the issue of the landlord’s good faith intention to demolish the building. Landlord asked the DHCR for permission to refuse lease renewals for three Rent Stabilized tenants. Landlord wished to demolish the building. In addition to the three Rent Stabilized apartments, there were two vacant units and three apartments that previously became exempt from rent regulation based on luxury decontrol. To support its application, Landlord submitted various documentation to the DRA including a deed, current tenant list, termination notices, a bank letter listing landlord's account balance in excess of $289,000.00, and a permit from the NYC Landmarks Preservation Commission (LPC). Tenants objected. They claimed that the application was incomplete and fraudulent. They said that landlord had no permit from the city for demolition, showed no proof of financial ability to pay for the demolition, and submitted no architectural plans or engineering reports. They also said that landlord didn't mention that the proposed demolition would be done in connection with demolition of the building next door, which contained rent-controlled tenants. Landlord then submitted architectural plans that it said were approved by the LPC and that it would submit DOB approval as soon as it became available. Later, landlord submitted architectural plans that were approved by DOB, and a letter from its bank stating that bank permission wasn't needed because the plans didn't affect the banks' mortgage on the property. Landlord also submitted additional banking documents showing over $400,000.00 on account. The DRA ruled for landlord. Tenants then appealed, claiming that the DRA didn't consider their arguments and should have held a hearing. The DHCR ruled for tenants and reopened the case. Tenants correctly pointed out that the DRA's decision didn't contain any discussion of the issues raised or whether landlord provided its good-faith intent to demolish the building. A hearing was needed to determine landlord's good-faith intent and address other questions. Any party aggrieved by the DHCR's determination may file a Petition for Administrative Review (PAR) in accordance with RSC Part 2529. The filing of a PAR shall stay such order until the final determination of the PAR by the DHCR Commissioner. Upon a showing that there are equitable grounds, the DHCR Commissioner may entertain requests for expedited processing of the PAR. After the PAR, an appeal can be taken to the Supreme Court of the State of New York via an Article 78 proceeding. Peckham v. Calogero, 12 NY3d 424 (2009). In 36th and Second Tenants Assn. v. DHCR, NYLJ, p. 26, col. 3 (10/20/97) (App. Div. 1 Dept. ), landlord applied to the DHCR for permission to demolish the building. Tenants in the meantime had filed a court appeal of the DHCR ruling in a harassment case. Tenants asked the court to delay the processing of the demolition application until their appeal was ruled on. The court ruled against tenants, refusing to delay the processing of the demolition application. Tenants appealed. The appeals court ruled against tenants. Tenants hadn’t proved that irreparable injury would result if the processing of the demolition application wasn't delayed. And even if the harassment determination was reinstated as a result of tenants' other appeal, the DHCR may still proceed with the review of the demolition application. The big objection that you will hear over and over – posited by owners’ counsel and tenants’ as well is simply this – Demolition Eviction takes too long. This is a ridiculous objection and I reject it. If you avoid getting started on Demolition Eviction (because you think it will take a long time), then of course it will take even longer. You cannot finish what you do not start. Owners tell me that their “other lawyers” tell them that Demolition Eviction should be kept as a last resort. Wrong. Demolition Eviction is what you should LEAD WITH. (d) it works if owner is not lying. And – News Flash – frivolous, purposeless, unethical holdovers take a long time too, and they have no chance of securing a vacancy, yet owners’ lawyers are recommending such tomfoolery. This is the finale. Every situation is different, and – quite obviously – this is not legal advice, and just because you are reading my booklet in your bathroom does not mean we have a lawyer and client relationship – but if there is a theme to this piece, it is simply as follows. When it comes to tenant buyouts -- Speak softly and carry a big stick. There are three keys to de-tenanting a building. One – PLAN. Rent Stabilization Due Diligence and Legal Project Management are keys to the success of any de-tenanting project. Two – Conduct yourself like a grown man (or a grown woman!). Understand the playing field and your tenants’ points of view. Treat tenants with the dignity and respect that you would want someone to treat your family with in a similar situation. Do not engage in harassment or frivolous holdover cases. Be direct with tenants about your agenda. Three – DEMOLITION EVICTION! There CAN be a relationship between an owner’s attempt to secure a buyout on favorable terms and the degree to which that owner is willing to push forward on a Demolition Eviction application. Demolition Eviction may take a long time to secure (all litigation takes a long time) and it may cost money (all litigation costs money); but it can be better than making the last Holdout tenant a virtual partner in your building by paying him huge numbers, or worse, walking away from the project. When faced with a properly prosecuted Demolition Eviction application, a tenant’s number has a great chance of going down….one way or another. Thus, I tell you – speak softly, respectfully, and honestly to your tenants, while wielding the only tool that will really recover your building for you – Demolition Eviction.